Last year when I started promoting my historical novel Sharavogue, I got several wonderful and very positive reviews on amazon.com, but was looking to spread the news to other readers. I requested a review from another place my book was listed, Indiebound.com. Great people there, but unfortunately I was matched up with an anonymous reviewer who I can only believe is a bitter and lonely individual. I say that not just because I received a bad review, which I did, but because it was unreasonably bad. Upon reading it, my hands began to shake. I had spent years carefully researching the time, the characters from that time, and all the details. 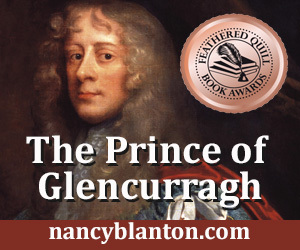 It was the details this reviewer zeroed in on, questioning in a rather nasty tone the book's title, whether a certain kind of tree was present at the time, and so on, including the basic opening sequence in the book in which Oliver Cromwell arrives in Skibbereen, County Cork, Ireland. The reviewer claimed Cromwell had never traveled that far. Now, since this is historical fiction, and it was at least plausible that Cromwell had visited the village in question, it does not really matter whether he actually did or not as long as I am clear in my author's note about the places where I have stretched the facts in support of the story. But I had studied Cromwell and found that he did in fact visit Skibbereen. I made two mistakes here. First, I had found an historical map (above) that actually tracked Cromwell's progress in 1649, going through and past Skibbereen in southwest Cork. It gave me a premise to work from but, not realizing I might need it later I did not file a copy. If I'd had that copy I could have submitted it to the reviewer to request a revision in the review. Which leads to my second mistake: engaging with the reviewer. Upon reading the erroneous review I sent back a message to Indiebound pointing out the errors in it based on my research. They sent my message to the reviewer for a response, and the result was a longer and even more erroneous and spiteful version of the original review. Indiebound passed it off as just a difference in opinion. Happily for me anyway, while researching my new book I came across the map again, from the British Library no less, and saved it in my files. Readers of historical fiction love a good story intertwined with fact, so that they can learn about historical lives and times as they are entertained. I know, I am an avid historical novel reader myself. But as they used to say, tongue in cheek, when I was in journalism, don't let the facts get in the way of a good story. Do be as accurate as possible because you will have to defend some of the details. Don't sweat a minor detail if it helps move the story forward or it doesn't really matter. And don't follow my example -- keep copies of or document everything you find that might be useful to your story. You never know when it might come in handy. I won't be sending this map to the reviewer at this late date, but I feel vindicated anyway. And that's why I say…it's good to be right! Get a copy of Sharavogue to learn about Cromwell's march in Ireland. When he gets to Skibbereen, the village is called "Skebreen" -- a shortcut the locals used. Cromwell is real, his march is real, and Skibbereen is real. The protagonist and her companions are fiction. The bridge in question is fictionalized based on undocumented legend, and a good story for sure!